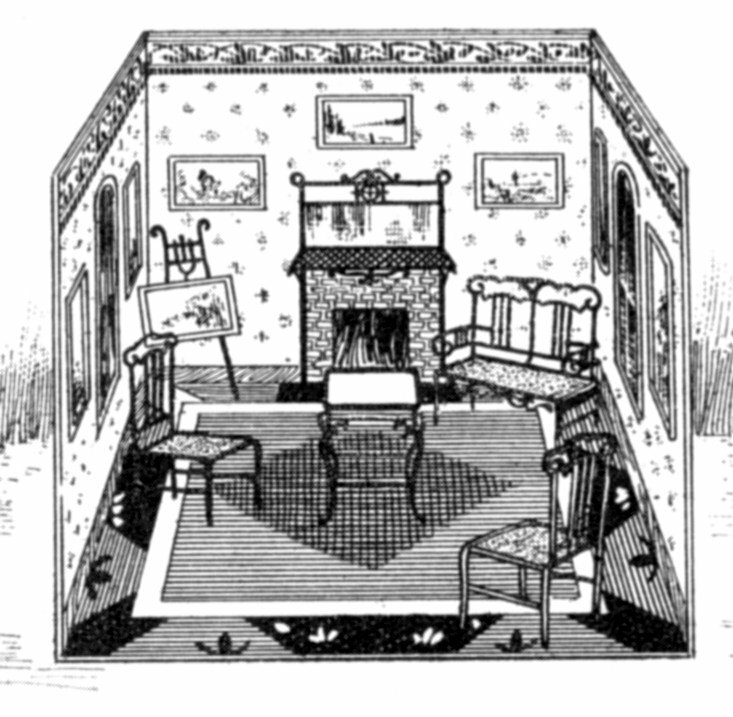 Open rooms on 21¼ in. 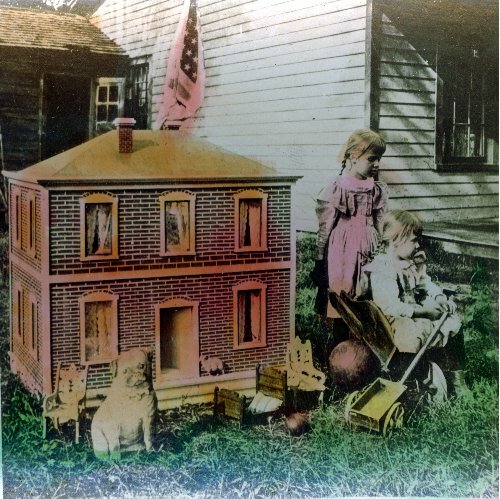 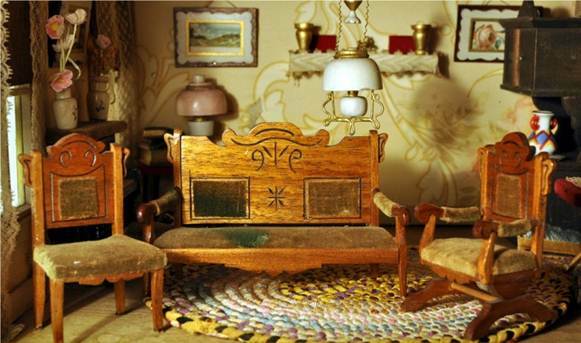 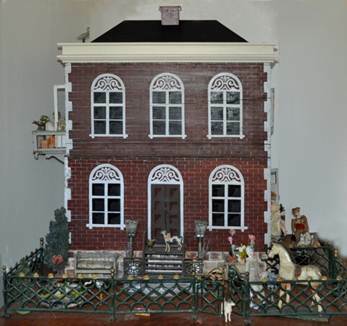 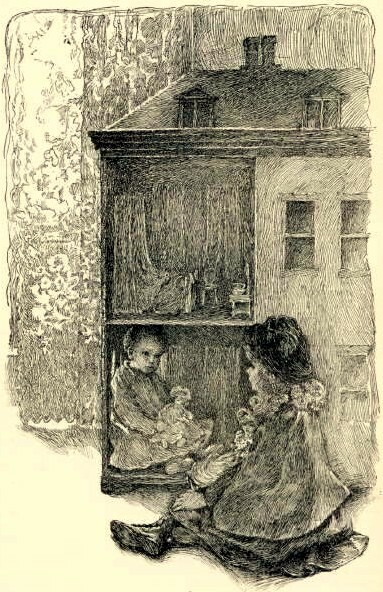 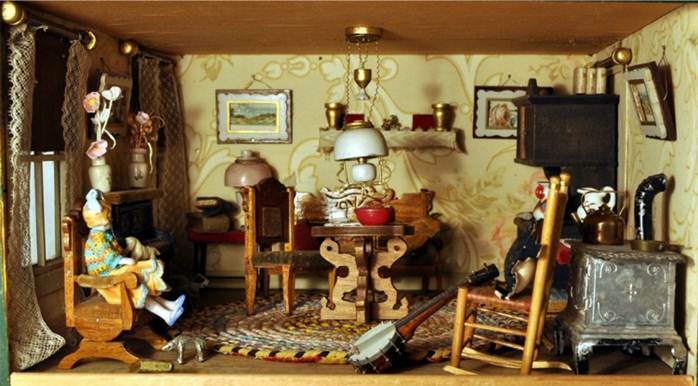 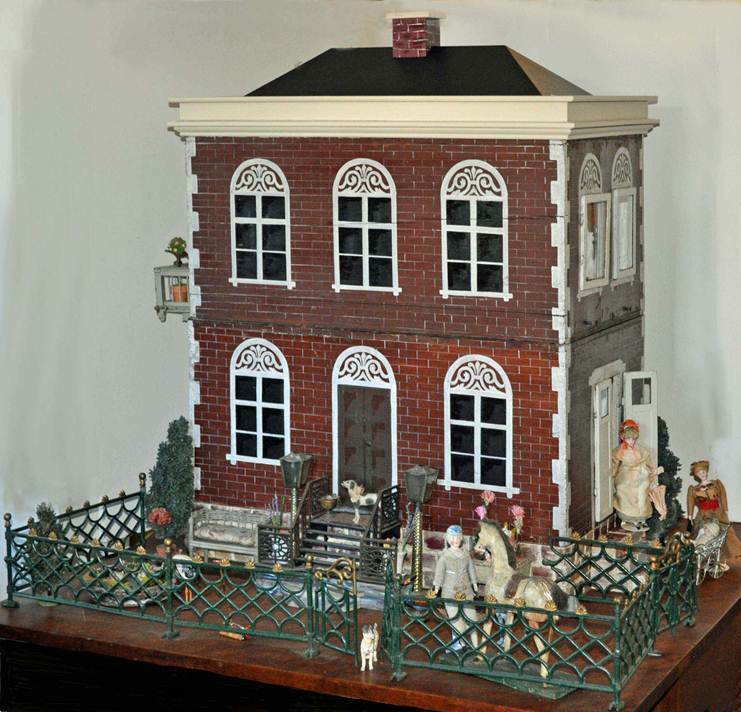 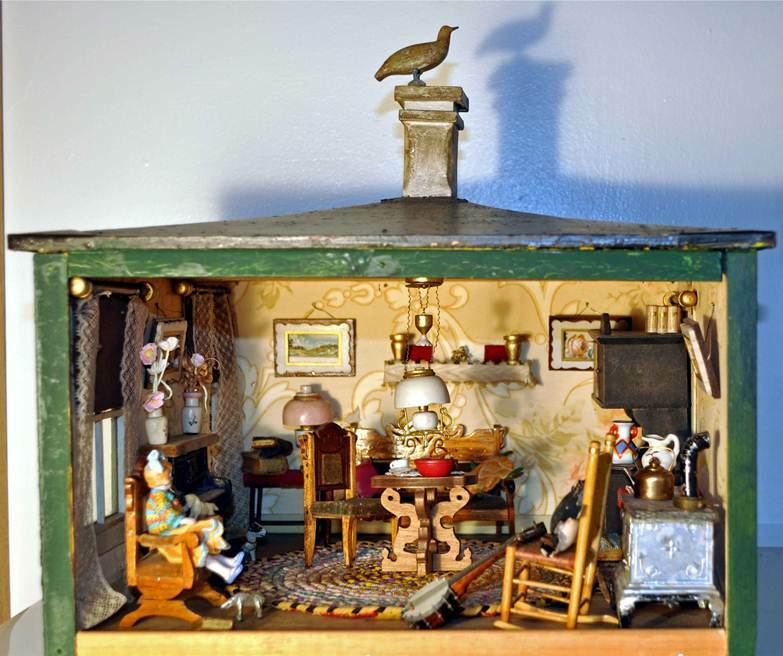 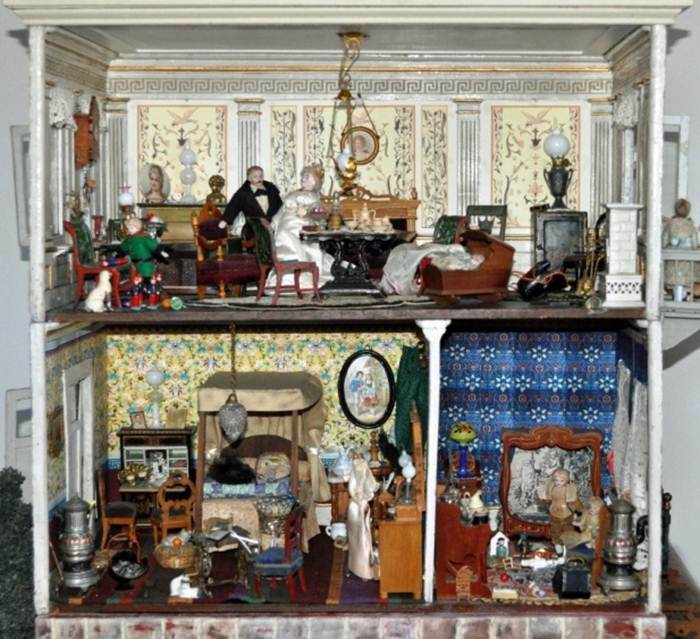 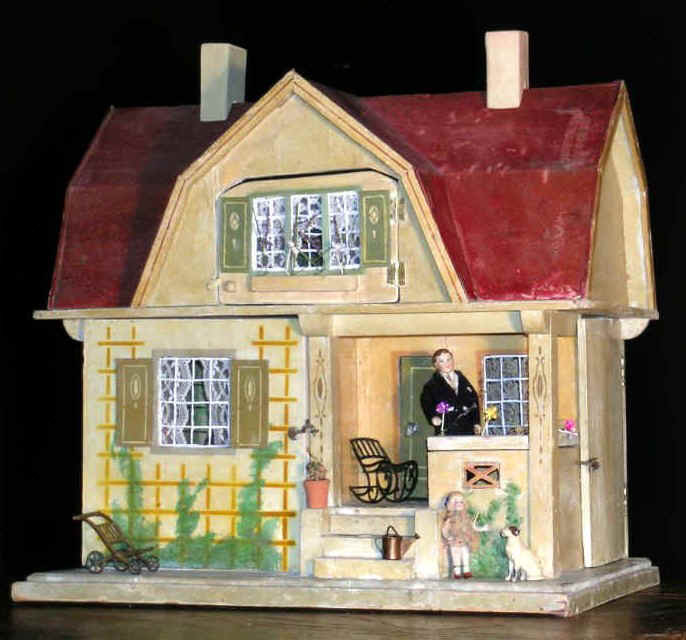 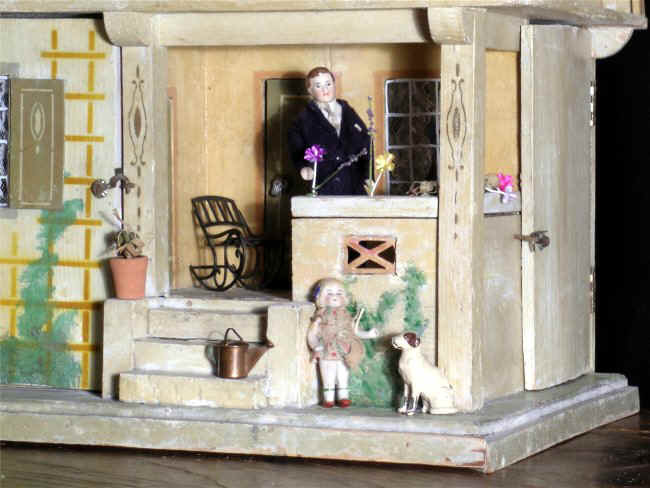 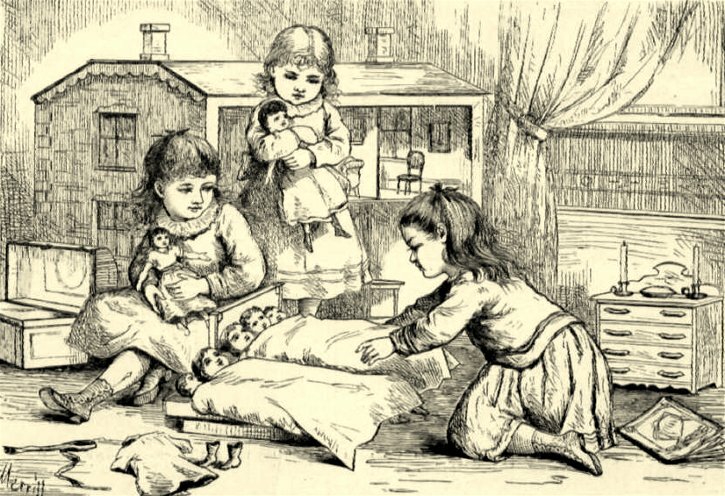 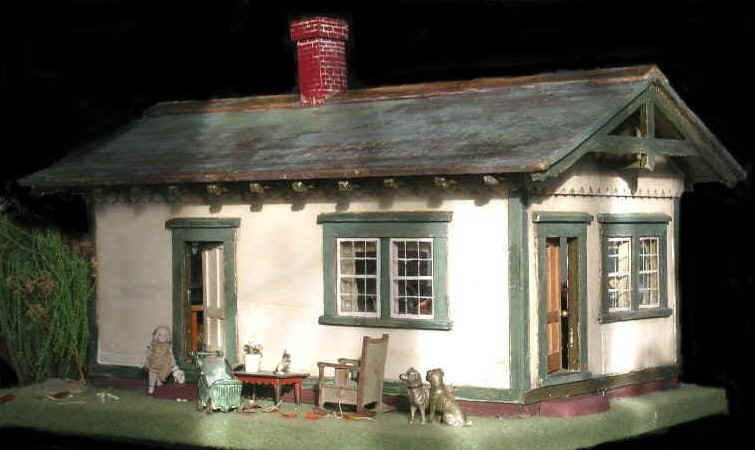 base, attributed to the German factory of Moritz Gottschalk (1840 - 1905), making dollhouses, furnishings and stables from about 1873 to about 1940, when World War Two interrupted toy manufacturing, which began again in 1947. 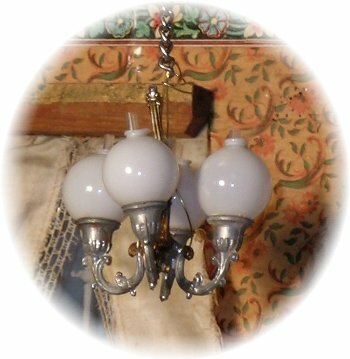 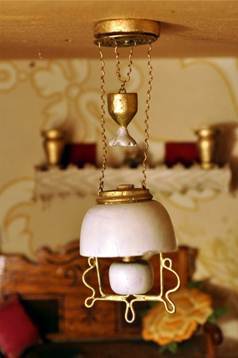 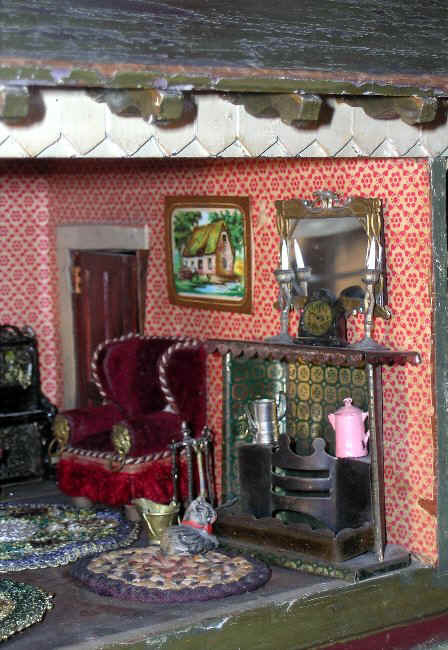 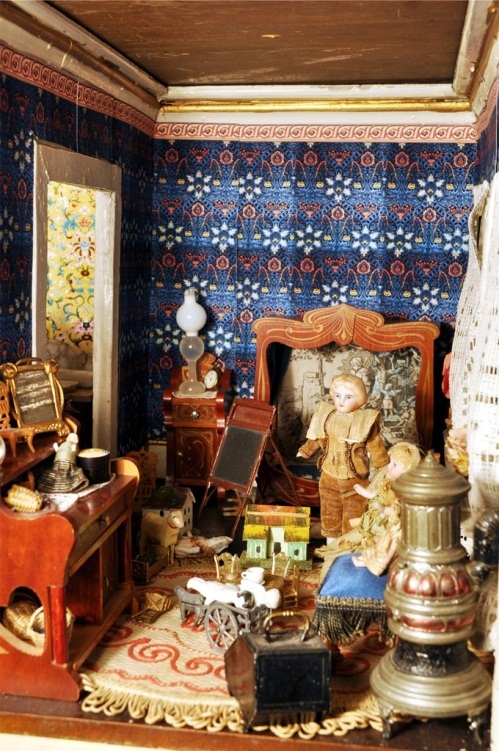 Although this particular set of rooms does not appear in the surviving catalogues from 1892 to 1931, certain features resemble ones shown in the 1890s. 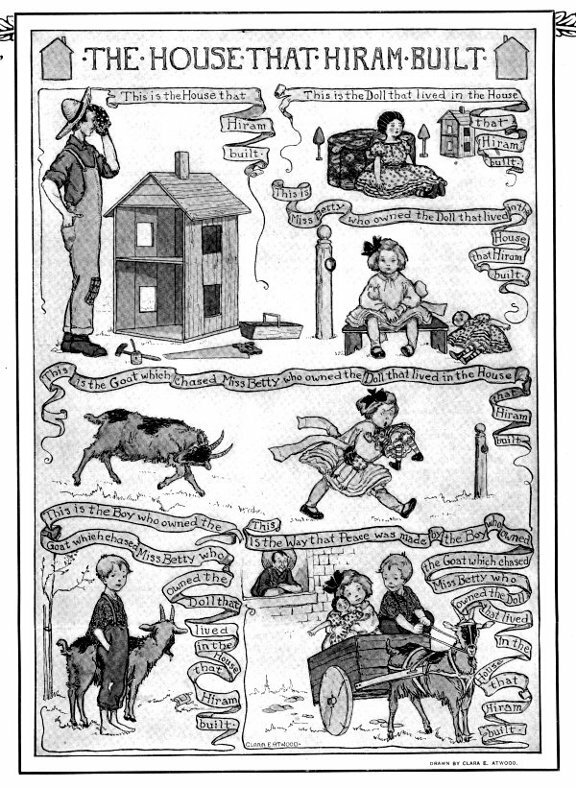 (See References for books on Gottschalk by Ackerman and Cieslik.) 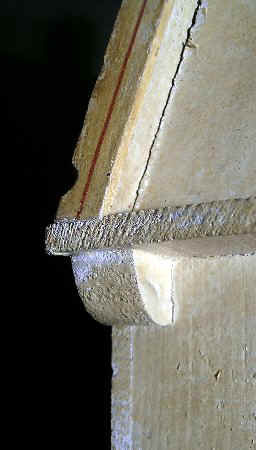 Hand-painted blue lines decorate the cream-coloured front 3-dimensional pilasters, made up of mouldings, a base and capital (but in the 20th century, the shafts are flat with painted decoration suggesting a base or with applied fretwork retaining a 3-dimensional capital but no base). 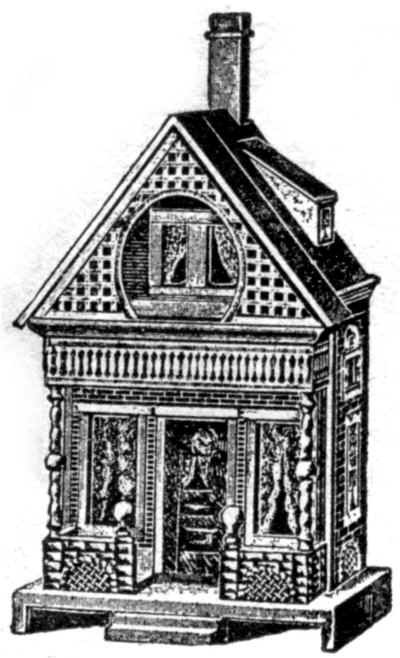 The main wooden base for the rooms has a simple angled profile at the front. 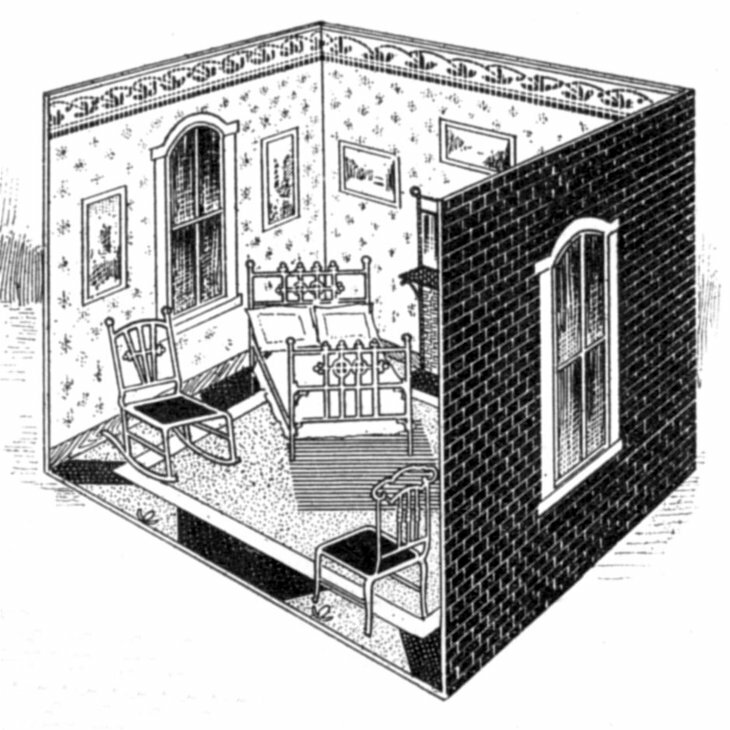 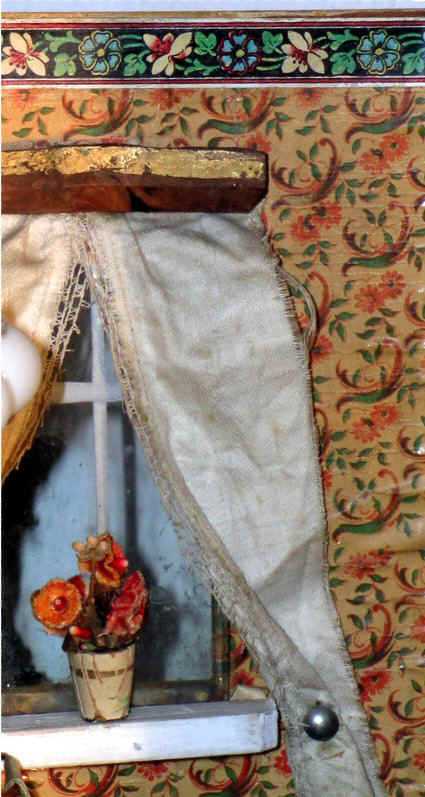 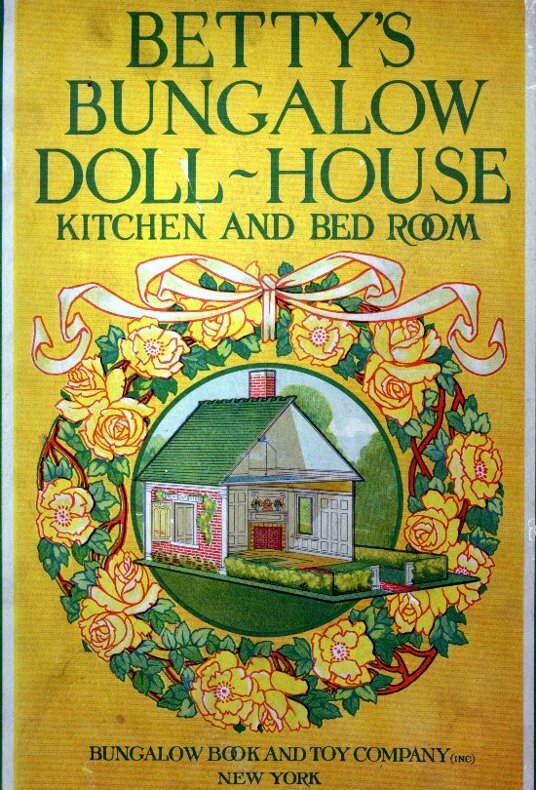 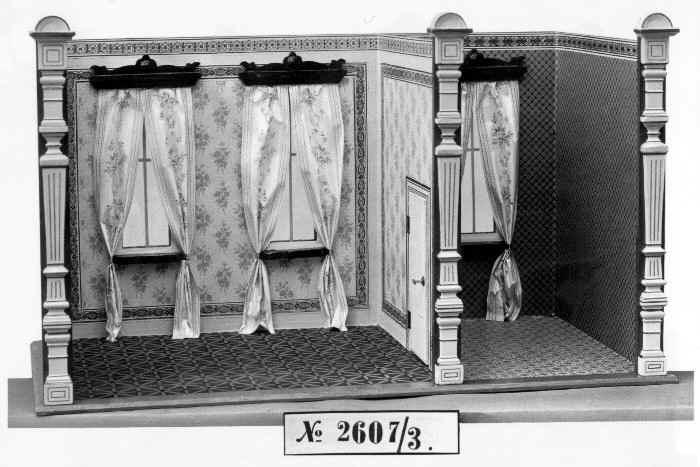 The geometric "tiles" on the floor (covered in colourful lithographed paper), rich floral wallpaper with contrasting upper border, curtains trimmed with lace edging and held back by pins with a metal head, simple wood mouldings fastening the curtains at the top (although some rooms have elaborate versions, as seen in the catalogue illustration above), and white window sills below glass panes divided by a cross painted directly on the glass all are found in various Gottschalk rooms in the catalogues. 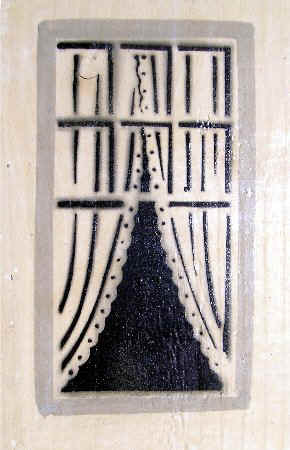 The passage door is white with lines painted to represent panels but on only one side, flat hinges show on one side, there are no d oorway mouldings, except a single flat piece into which a pivoting wire can be turned to hold the door shut. 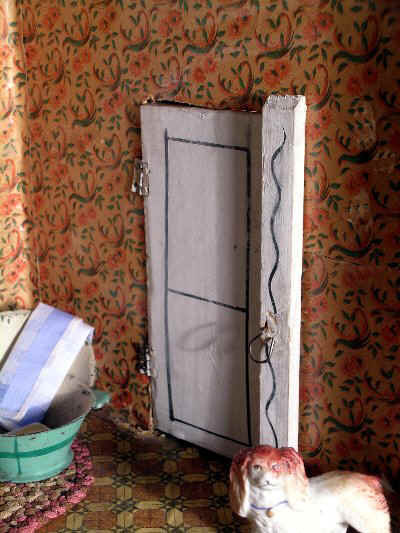 The painted lines and construction of the door and doorway are surprisingly crude in comparison to the sophisticated wall and floor papers. 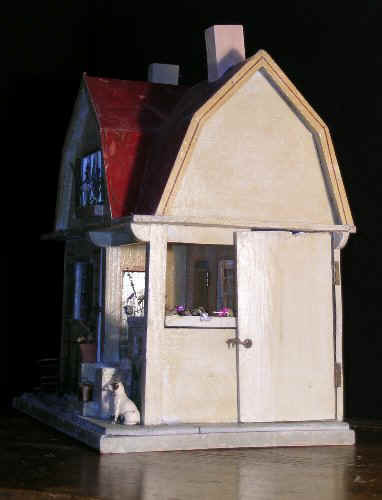 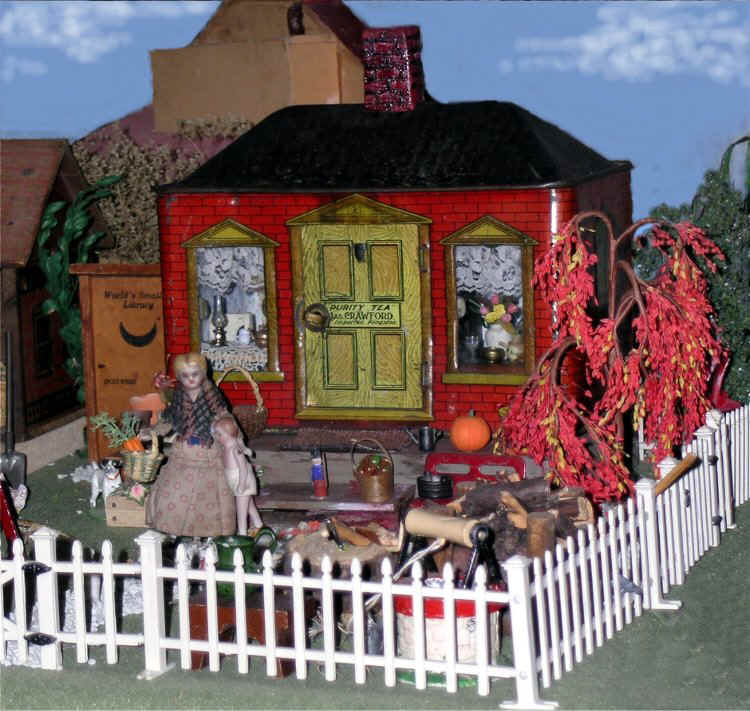 Moritz Gottschalk "red roof" dollhouse. 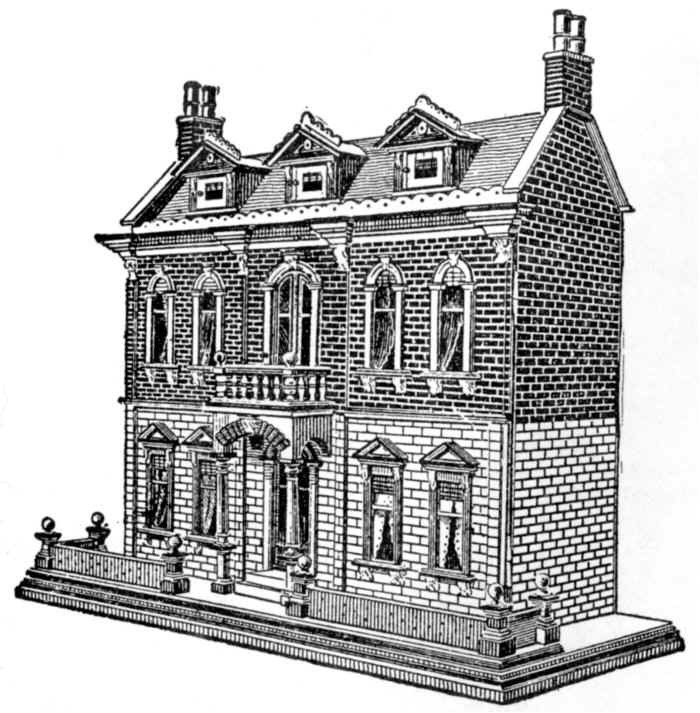 The missing dormer window was restored based on the illustration from the 1910 catalogue (below), as were the glass windows and chimneys. 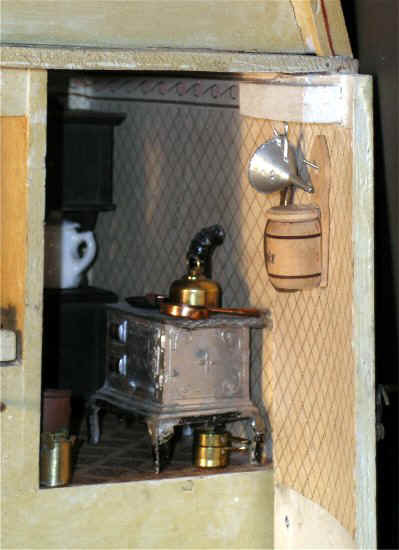 The narrow kitchen accessed from a doorway in the recessed porch or from a swinging wall panel. 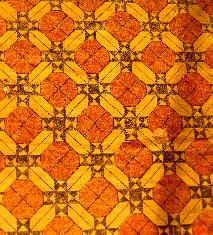 The wall paper and paper "tiled" flooring are original. 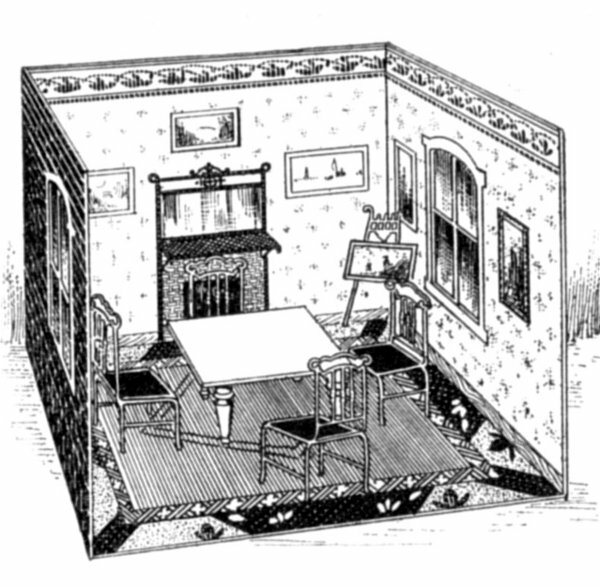 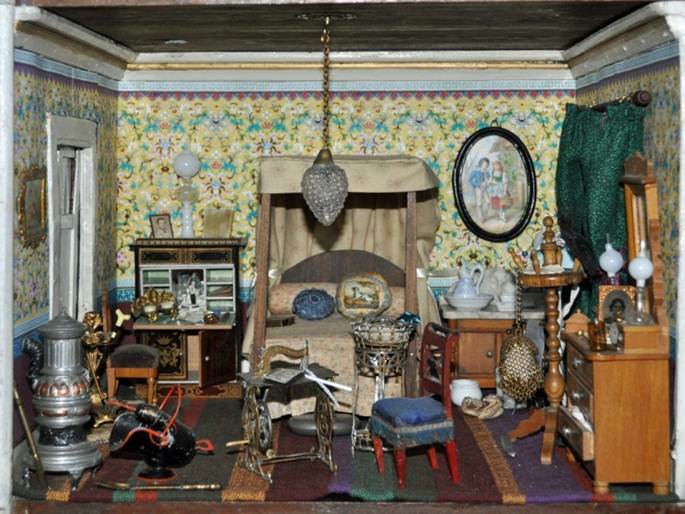 There are three rooms: parlour, kitchen and bedroom. 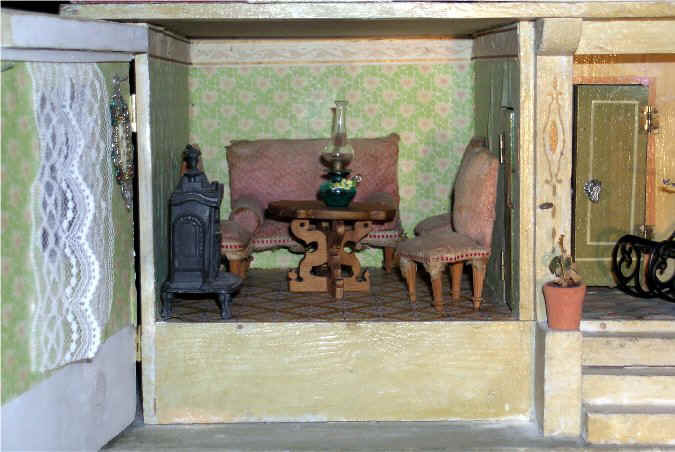 The first is accessed from a doorway off the porch and a swinging wall panel, the second also has a doorway onto the porch and a hinged wall panel and the third is accessed from a hinged window (restored). 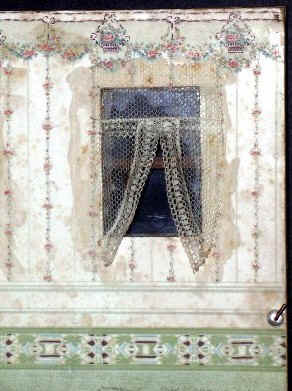 Note the typical Gottschalk slab door with a painted panel and handsome knob, which pivots on a staple on the reverse of the door. 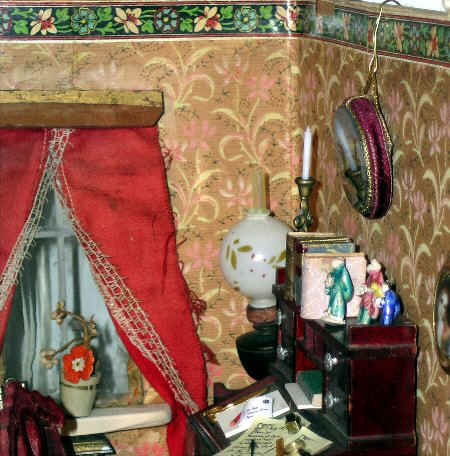 The wallpaper with its upper band and flooring are original but the curtains are replacements. 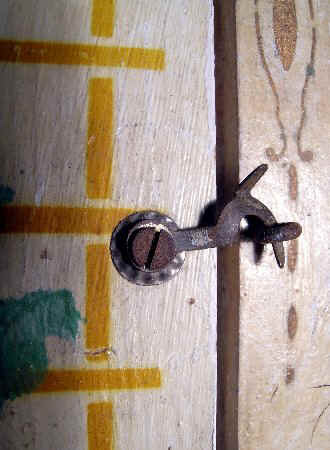 Original typical Gottschalk clasp and details of stencilled trellis. 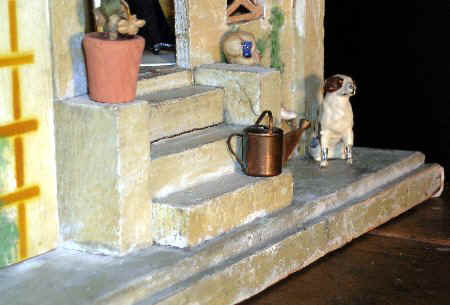 Original steps. 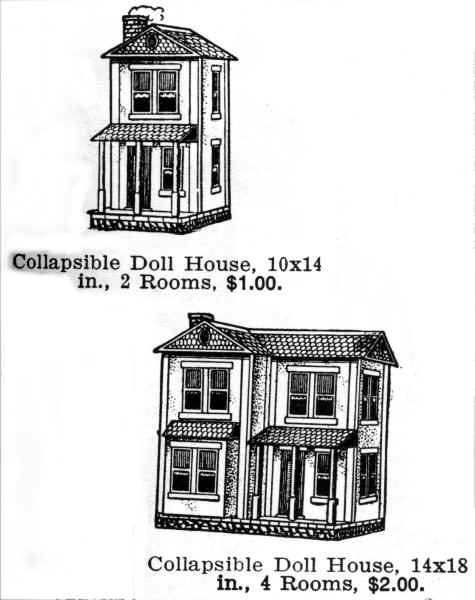 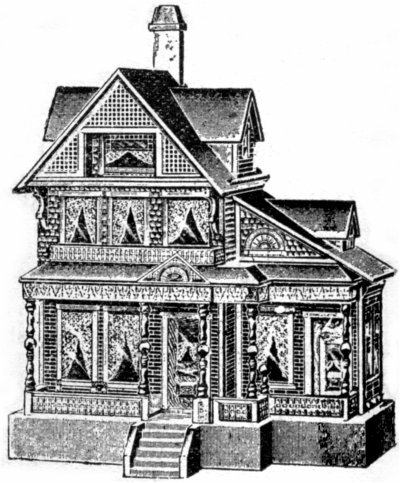 Style and form: the dollhouse is dominated by a gambrel roof, intersected at right angles at the front by another gambrel roof sheltering a wide dormer, also seen (above) in the 1928 house in an American catalogue and in a 1904 architectural pattern book, although in this case the dormer is on the house's side wall. 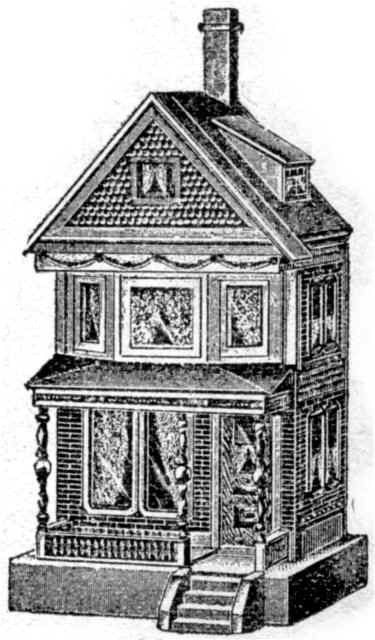 The gam brel roof (the main slopes angle out about half-way down permitting more headroom in the upper floor) is one more example in the 19th century of medieval revival forms.This roof type is found on 17th and 18th century houses and shops in the USA (right drawing made in 1886, at the time this form was becoming once again fashionable) derived from British and European models. 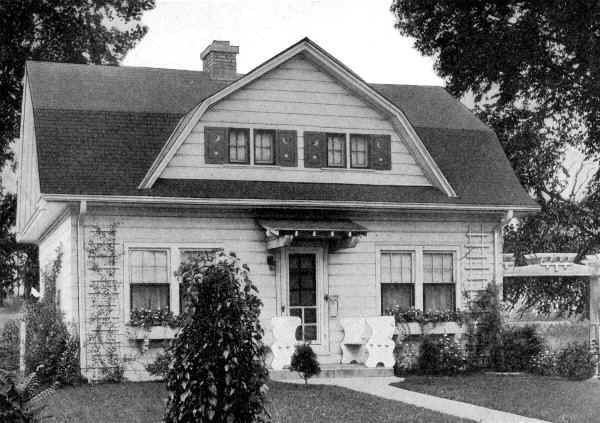 In American terms, such early 20th century houses were known as "Dutch Colonial". 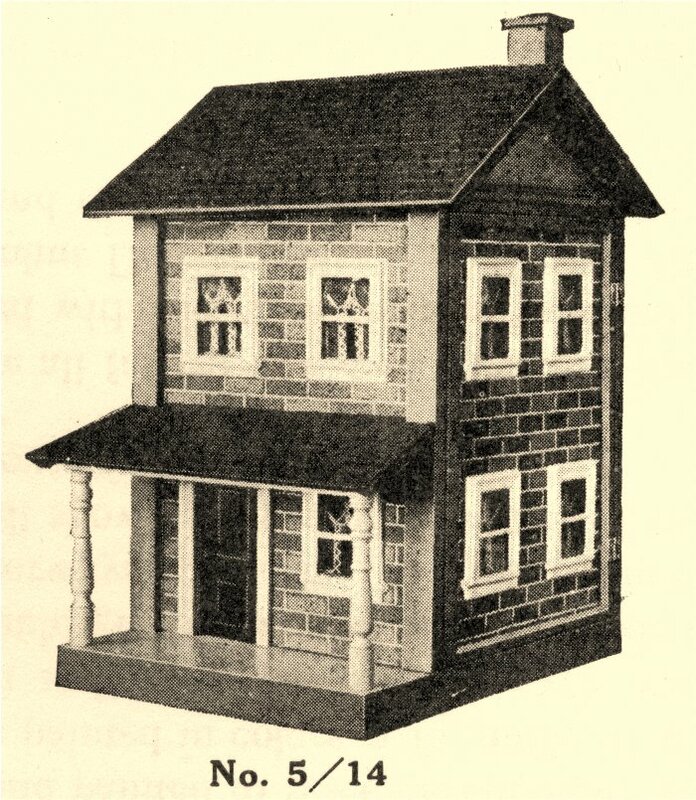 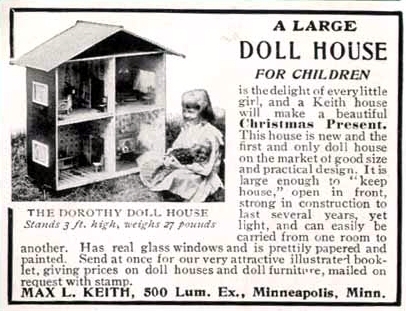 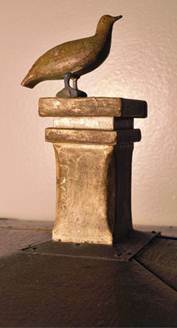 The German firm of Gottschalk was wise to incorporate a house form popular in the USA, where many of their products were sold. 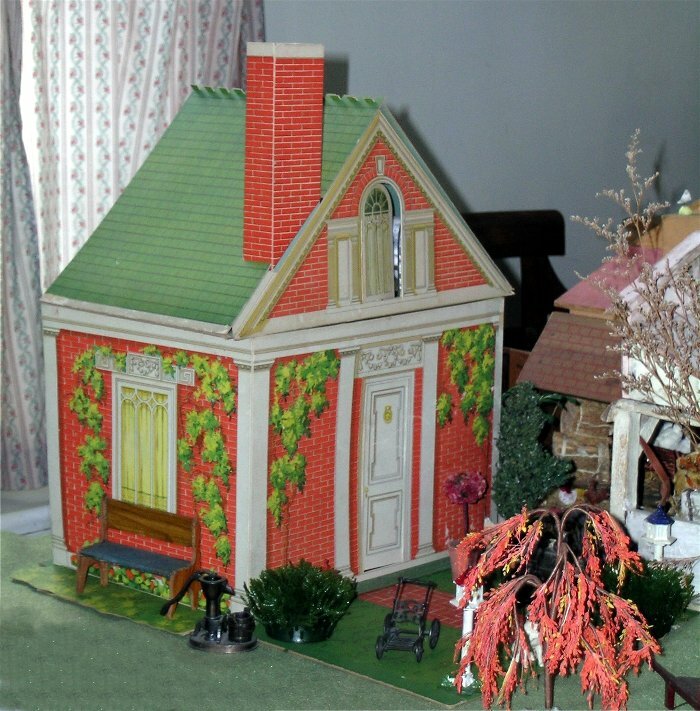 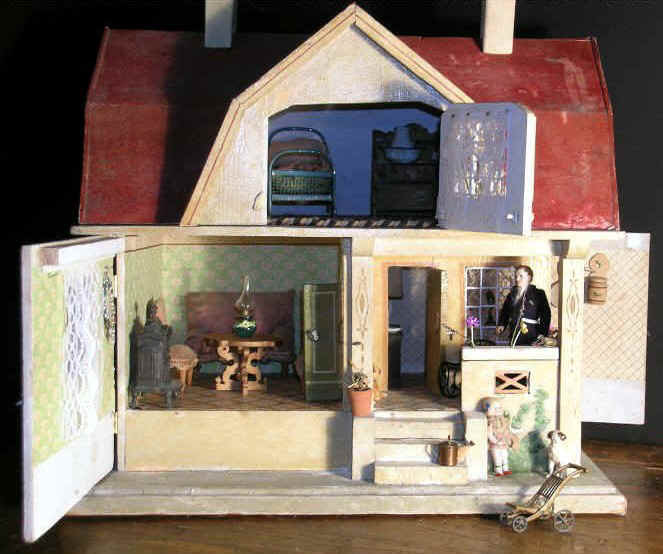 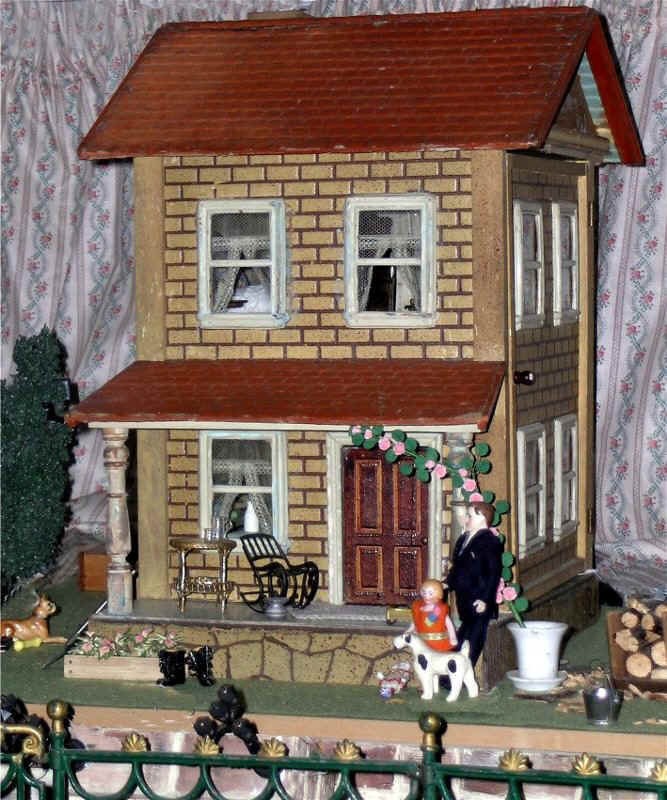 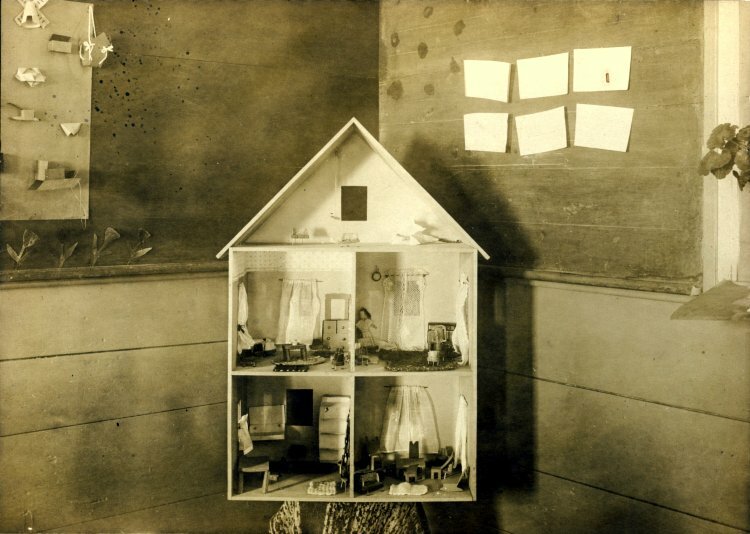 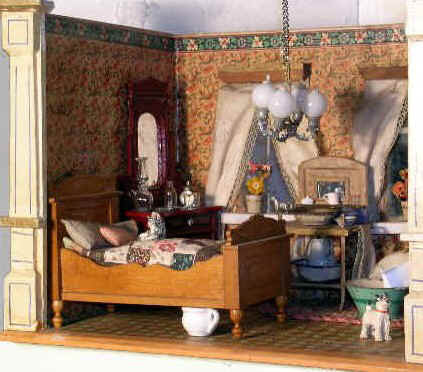 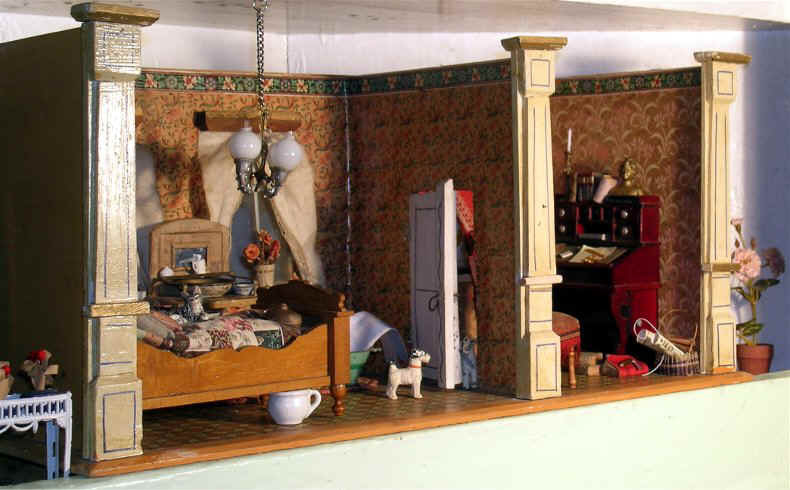 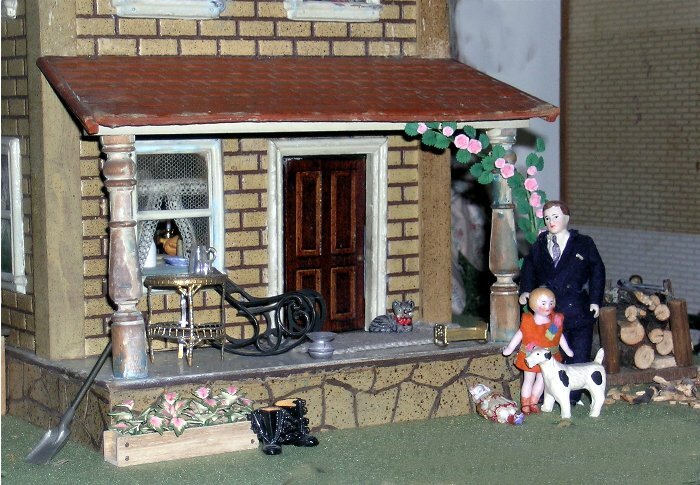 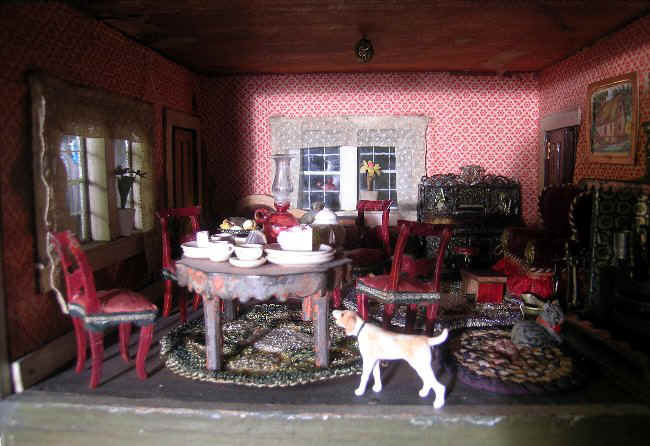 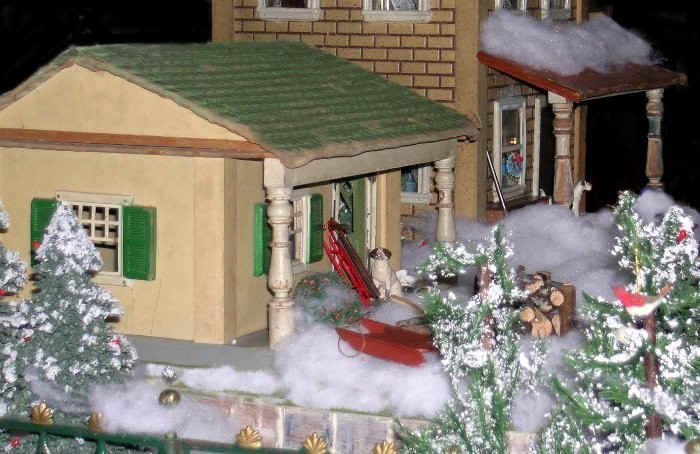 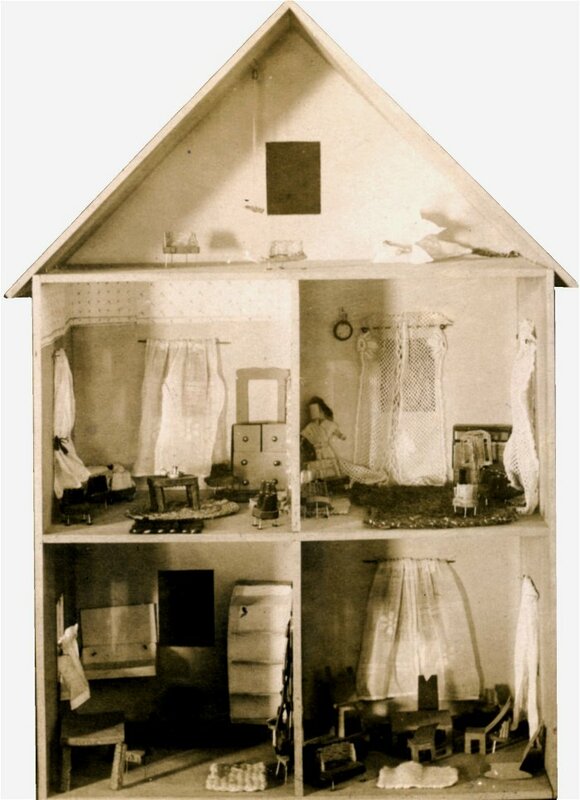 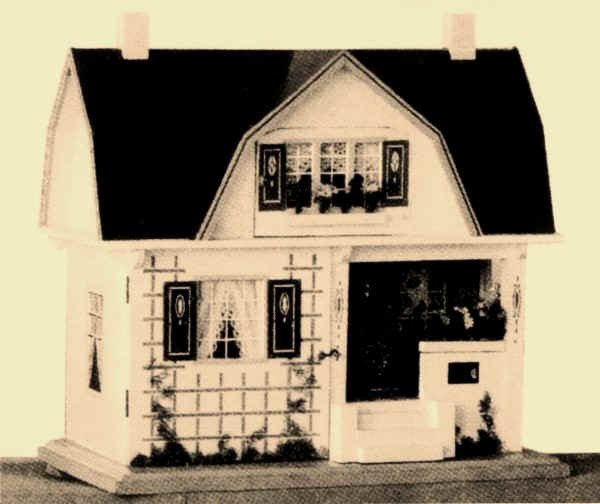 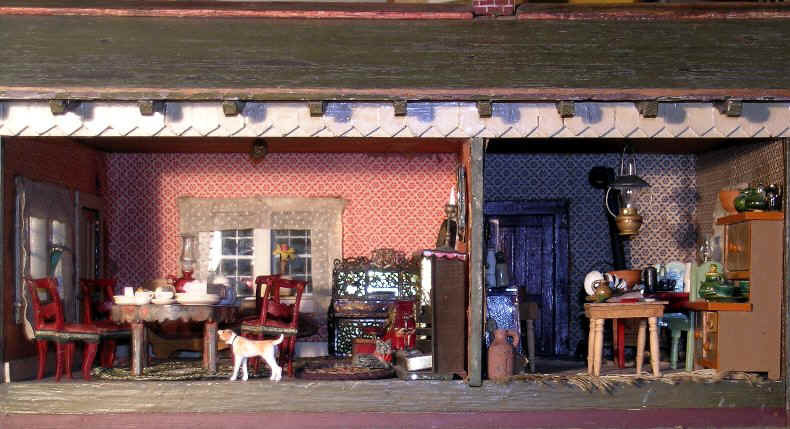 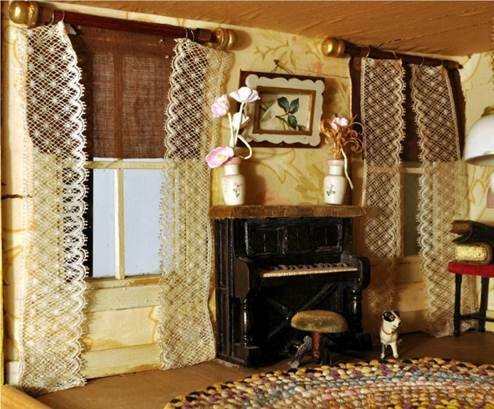 The gambrel roof form appears in 1905 in Gottschalk dollhouses ranging from one main floor with an attic to three floors with an attic and from simple houses to elaborate. 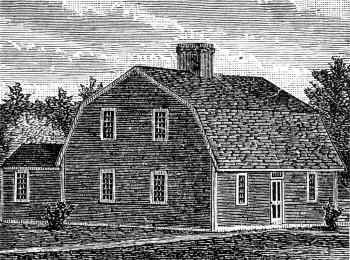 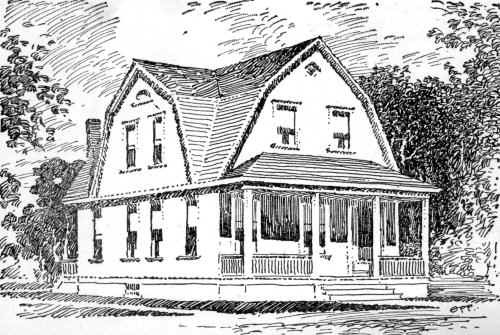 These houses usually had gambrel-roof dormers, sometimes decorated with half-timbering. 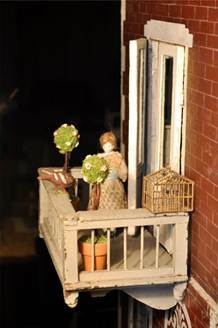 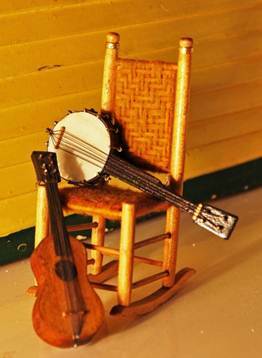 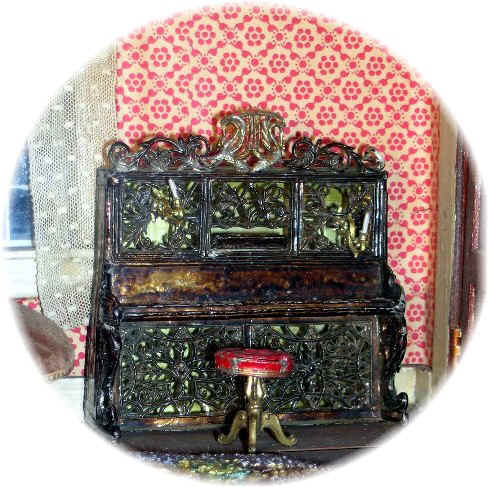 Trellises -- real or stencilled, flower boxes (each a simple rectangular length of solid wood punctured with holes to receive the stems of flowers), shutters and recessed porches reflected popular ideas about what cozy aspects made a house a home. 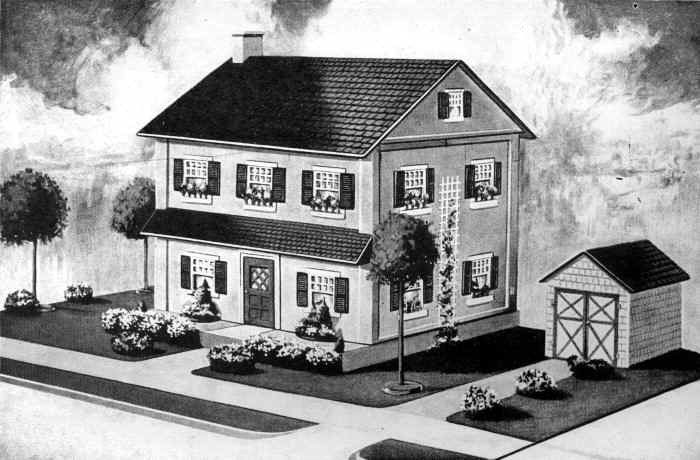 The gambrel roof seems to have fallen out of favour at Gottschalk in 1929, when the clean lines of simple gable and modern flat roofs were particularly popular. 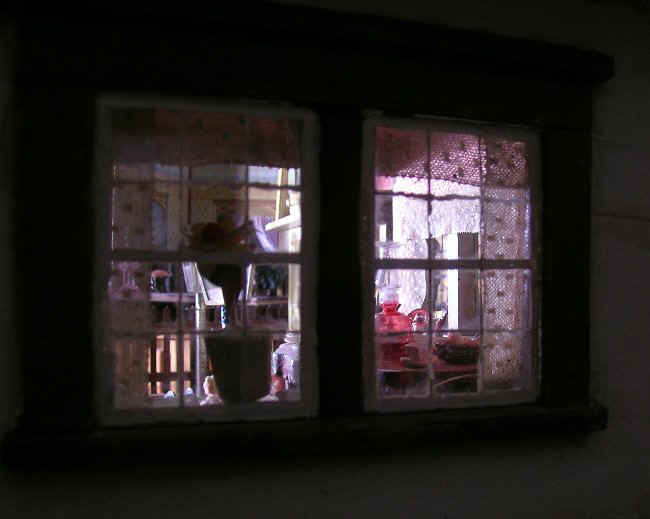 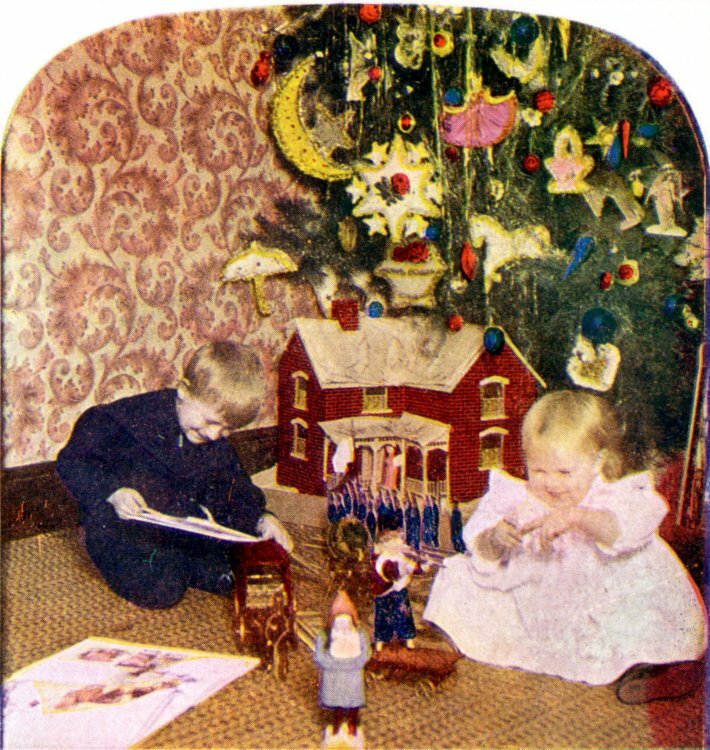 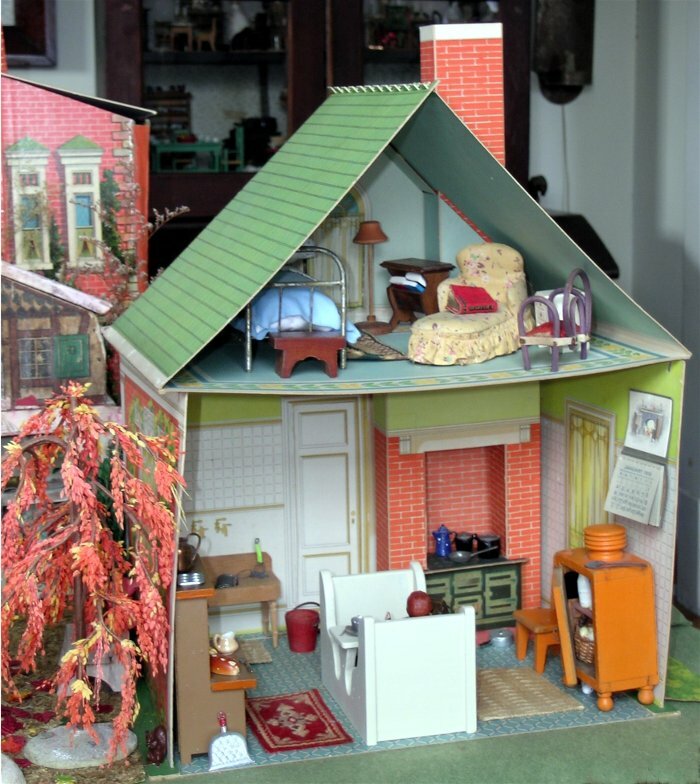 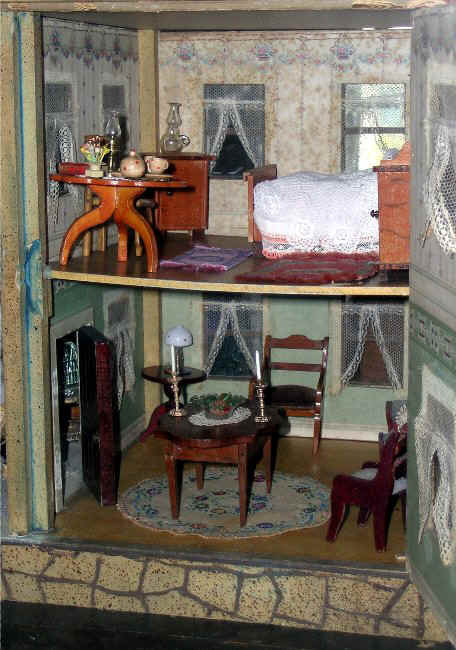 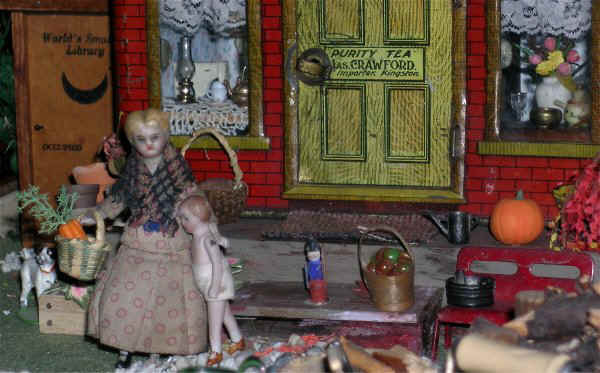 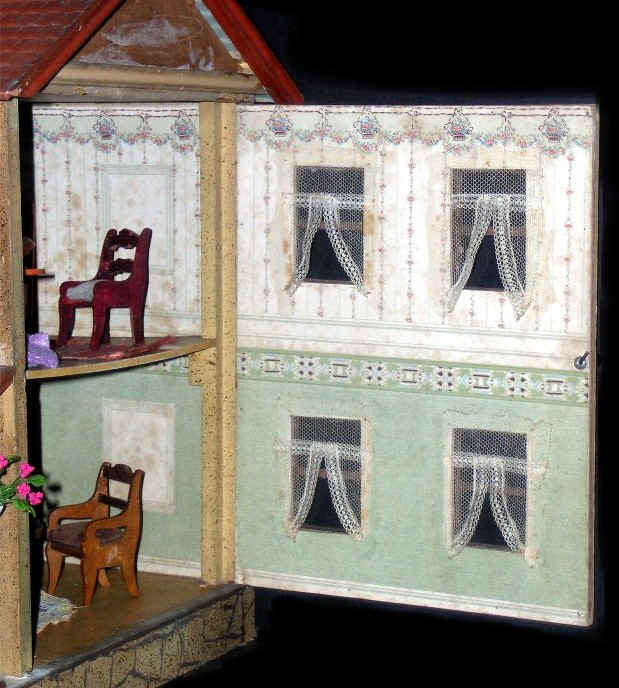 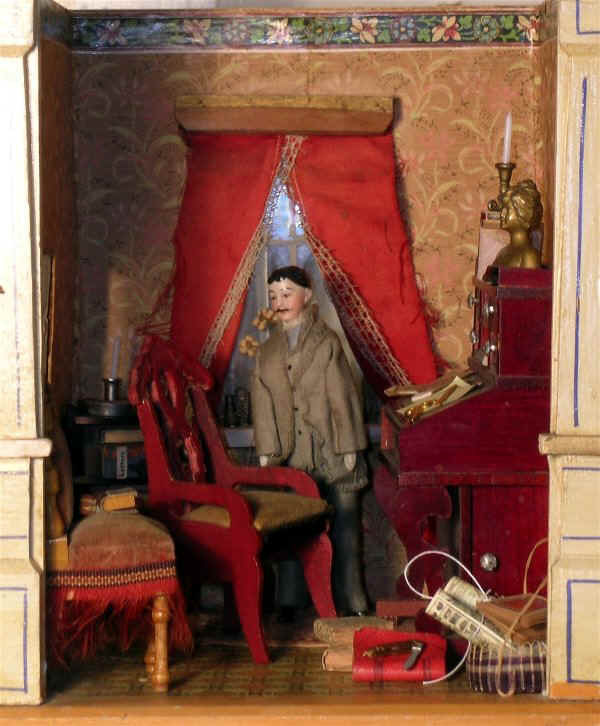 Roofs changed in colour from deep blue to red about 1910, the date of this dollhouse. 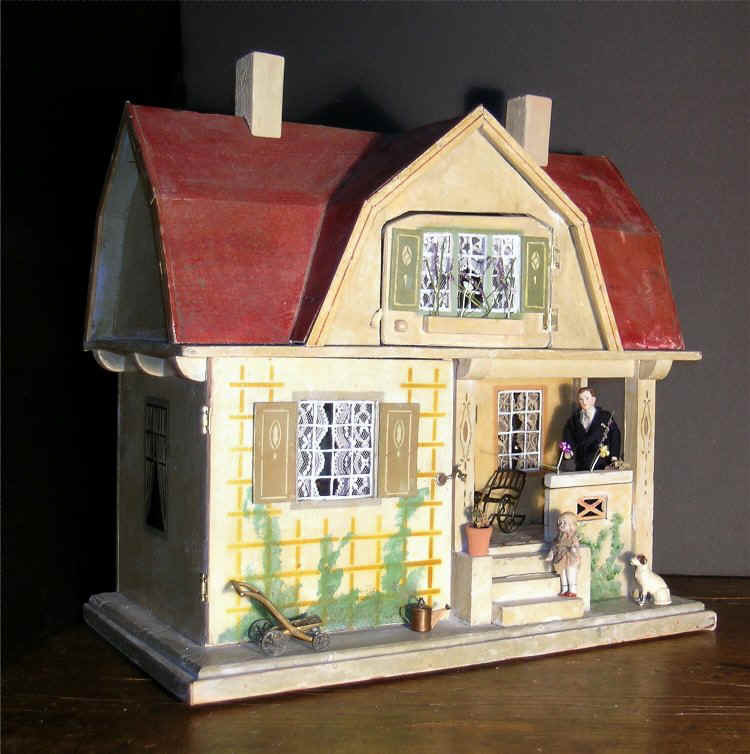 Purity Tea Canister, painted tin with glass windows, in the form of a house with a door that opens, James Crawford, grocer, Princess St, Kingston, Ontario, Canada; in business 1881 to 1920; marked on the back is, "This style & design of Package Registered by Baird & Peters of Ottawa." 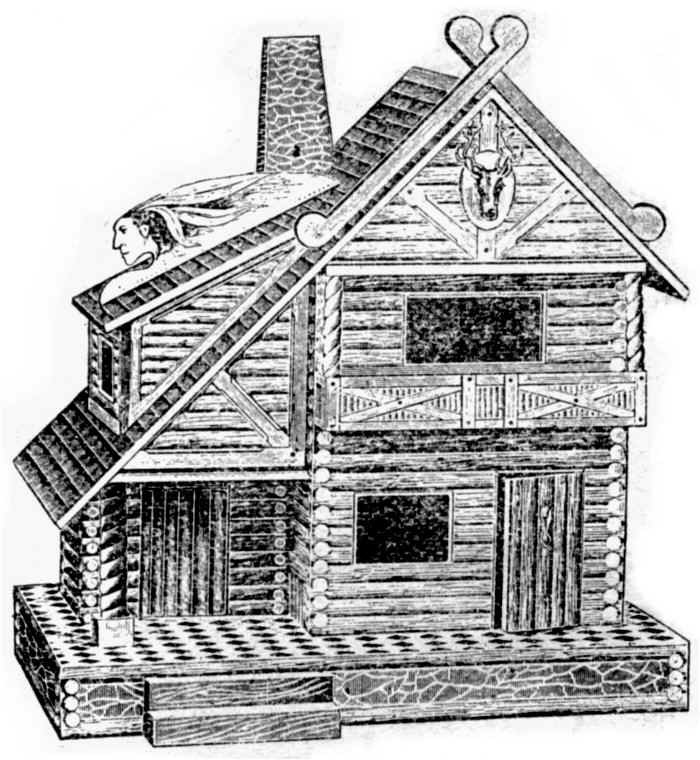 the rustic Adirondack Cottage complete with a roof handle in the form of a member of the First Nations (#662 below, attributed to Bliss). 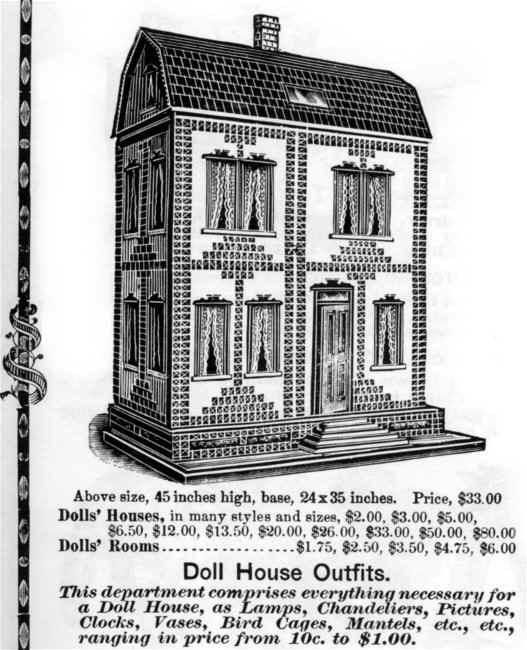 None of these designs are shown in the 1911 Bliss catalogue. 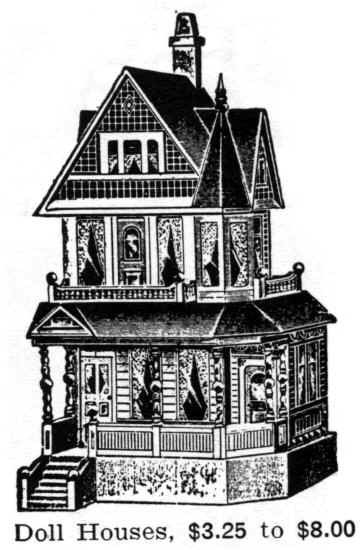 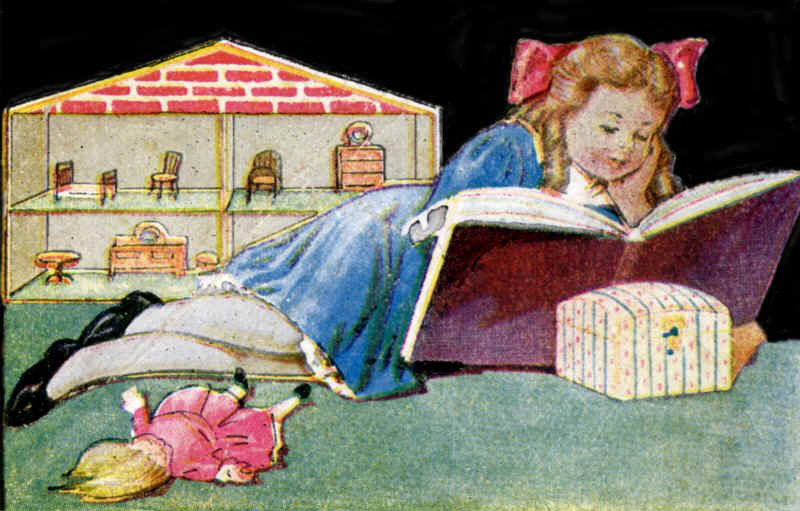 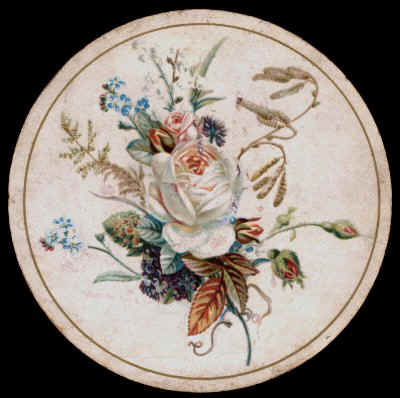 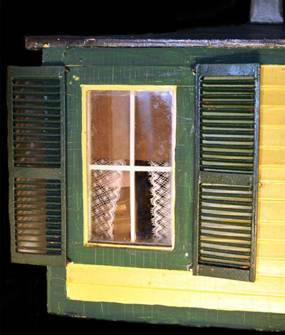 Bliss began making lithogrphed paper on wood houses in 1889.